There were three principal objectives that drove the creation of Our Lady of Guadalupe Prayer Garden: • Provide a place for people to pray and meditate when the church building is unavailable. A place where everyone feels welcome and safe. The theme of the Prayer Garden is Peace and Hope. • Bring people together. Facilitate a sense of community, not only within our own diverse parish community, but also within the larger Windsor community. We all are a community of God’s children. • Finance the process primarily through a sponsorship program in which many members of the parish will be able to participate. There was to be no single large donor. A small number of key elements of the design, such as olive trees, benches, and gateway markers would be financed through sponsorship by an individual or a ministry. 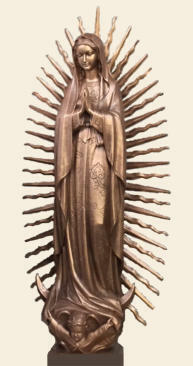 The bronze statue of Our Lady of Guadalupe would be financed through a brick sponsorship program that would pool relatively small donations of a large group, thereby offering affordable sponsorship opportunities to a large number of individuals.